1 of 5 Heat oven to 350 degrees . In a bowl, combine masa harina and salt. Pour 2 cups boiling water over masa harina; stir well. Mix in melted butter. Cover dough with plastic wrap and let rest for 15 minutes. 2 of 5 Shape dough into 8 balls. Place each ball between 2 pieces of plastic wrap and carefully flatten with a pan to form disks measuring 3 inches wide and 1/2 inch thick. Mend any cracked edges with your fingers. Place arepas on a baking sheet; cover with plastic wrap. 3 of 5 Heat 1 tbsp of the oil in a cast-iron skillet or saute pan over medium heat. Add 4 arepas to skillet. Cook 5 minutes on each side, until golden brown. Transfer back to baking sheet. Add remaining 1 tbsp oil to skillet and repeat cooking with last 4 arepas. Place baking sheet with all 8 arepas in oven and bake at 350 degrees for 15 minutes. 4 of 5 Meanwhile, slice chorizo lengthwise, then cut each of those pieces in half on the bias (there should be a total of 8 pieces). In the same skillet, cook chorizo over medium heat until hot and browned, about 6 minutes. 5 of 5 Slice hot arepas lengthwise about three-fourths of the way through. 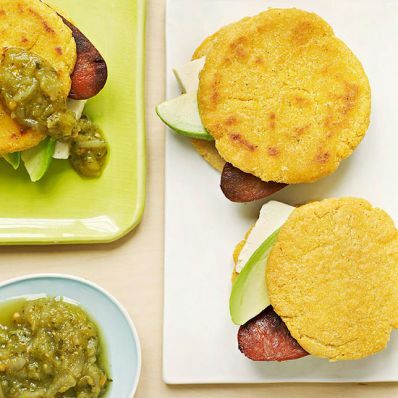 Fill each with a piece of chorizo, avocado and cheese. If desired, drizzle with tomatillo salsa. Serve immediately. Per Serving: 4 g fiber, 21 g carb., 4 g sat. fat, 20 mg chol., 291 mg sodium, 7 g pro., 13 g Fat, total, 226 kcal cal.